darkSpyro - Spyro and Skylanders Forum - Skylanders: SuperChargers - Any standard Hot Streak unlocks the iOS game! Yay! darkSpyro - Spyro and Skylanders Forum > Skylanders: SuperChargers > Any standard Hot Streak unlocks the iOS game! Yay! Any standard Hot Streak unlocks the iOS game! Yay! ^I...can't...trust...can someone here try this out? Also screenshots please? I don't have a Facebook account. The "Unlock Game" buy option is $39.99 and it says it will unlock the entire game and The Academy. 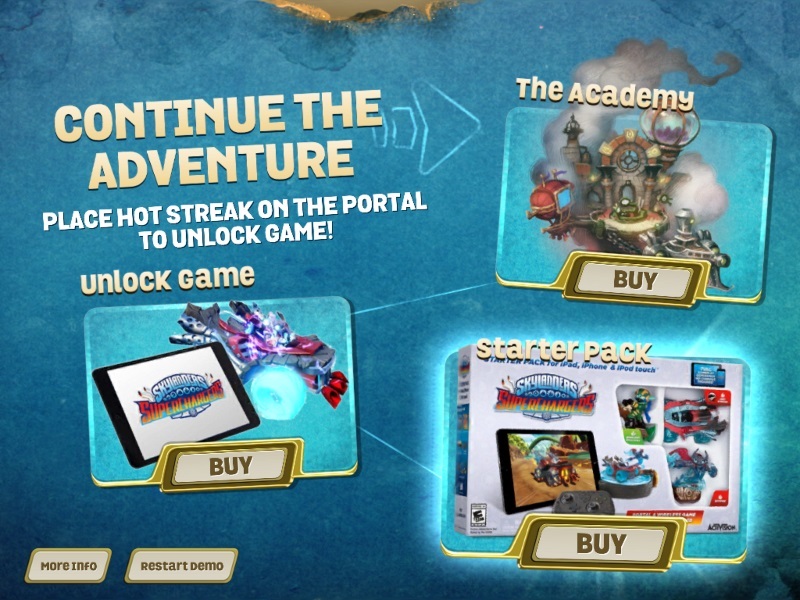 "The Academy" buy option is currently on-sale for $2.99 and says you can continue the adventure with the Skylanders Academy and get access to Racing, Supercharged Challenges and Vehicle Zones. The "Starter Pack" buy option takes you out of the game to a browser on Amazon to purchase the full starter pack at whatever the current going price is. I hope this helps to clear things up a little on the unlocking from the Fakebook post. In theory, one could just buy the bundle, take it home, unlock the game without opening it, then easily return the bundle. This entire system is weirdly planned. Thanks for posting some first hand info. That helps. Are we sure that would work? The Starter Pack seems quite big, don't know if the Portal could read Hot Streak's chip through it. The question is, if you unlock the game with the starter pack Hot Streak, would it be unlocked to your Apple ID? So if you deleted and re-installed the game or installed it on another device, would you need the Hot Streak for every install or would it already be unlocked? If it was unlocked to your Apple ID, then you wouldn't need the Hot Streak once you unlocked it, so losing it or accidentally selling it instead of the other Hot Streak, wouldn't be an issue. I don't have an iPad, so I don't know how it worked with Trap Team and can't remember how it worked when I had to get a new Kindle Fire and had to re-install it (which could handle it differently, anyway). But since this works for iPhone and the new Apple TV, I might be interested. I appreciate the info, but any information showcasing how to subvert payment for the unlocking should be avoided. Activision has determined you are not entitled to the game if you buy it on the console, so let's keep this forum respectable, eh? I would urge the OP to remove that content and do "the right thing". I agree 100%. The proper action to take if you feel they have priced this unfairly is to not purchase it until they lower the price or change their terms. Stealing is not the answer. The fact that people feel they are taking advantage of customers is not justification. If it is anything like last year, you will probably see deep discounts on it by early next year. The mobile Starter was as cheap as $9.99 on Amazon last January. That' small good to know. I'll wait until the starter pack gets cheap. I originally made this topic cause I basically made a bad choice of buying Jwt-Vac when I couldn't use him (accidentally), but feel free to keep discussing. Yep, I got mine fair and square for $10 like you (mainly b/c you gave me a heads up lol). Just do what any patient buyer does...wait and watch. I should clarify that my post wasn't an attempt to subvert their unlocking system - more of a discussion of how awkwardly weird the choice they made was. I've gone on record before that I don't believe it's right to take the figures home, use them in-game, then return them - never intending to keep them from the start. That applies here. I don't even think this system is bad (as in evil-bad)... just very poorly planned and needlessly confusing. Is anyone else experiencing save issues with the iOS version? Just tried it last time and got past chapter 4. Asked to buy, clicked on Amazon link....came back and it restarted all over with he intro video and all. Tried it a few more times, still issue. Does not seek to be saving correctly. jlieu- have you already purchased the starter pack? If you leave the game via the Amazon link, and then return to the game, it's likely that the app will start from boot because iOS runs out of memory after going to the web browser for the amazon link. The game uses a lot of memory. There is an issue with iCloud which we are working on fixing. There is also an issue if you unlock the game with Hot Streak on the title screen, you may later get prompted to buy the game. You just need to take Hot Streak off the portal and put it back on the portal when you are prompted to buy the game. That should unlock the game. One note that I thought i'd mention. If you purchase the Superchargers iOS starter pack, you can use the portal to unlock Trap Team on iOS too. Btw, does the starter pack come with a controller like the Trap Team pack did? It was totally cool to play this on the phone but using the on screen controls are useless. Yes starter pack comes with the Bluetooth portal (same as Trap Team) and the Bluetooth Skylanders controller. For anyone who has purchased a console Superchargers starter pack (and has Hot Streak), and happens to have a Trap Team Bluetooth portal from last year, we are looking into the possibility of unlocking the iOS and Apple TV game with any Hot Streak variant. That way you could play on iOS or Apple TV if you already purchased Superchargers for console. Or bought the Trap Team tablet starter pack last year and happen to have the E3 Hot Streak or golden Hot Streak, etc. Gotcha, I will give it a try later tonight. I was playing around with "Buy Code" then went to try the "Purchase" option afterwards which took me to Amazon. To my surprise when I went back to the game....everything restarted. We already have the PS3 & Wii U version; but between 4 kids...we are considering the 3DS and iPad/Tablet version for traveling convenience. Kids love their iPads. Of note, while picking up Mega Yarn Yoshi this weekend, I checked the iOS bundle on the demo portal - Hot Streak reads through the box perfectly fine. I wasn't going to get Mega Yarn Yoshi, but man he is a cute thing. My youngest loves stuffed animals (has a bunch of Mario and Skylanders stuffed ones), and I was able to use that 20% coupon on him so went for it. Amiibos might not be as useful in game as Skylanders or Infinity, but they are great collectibles if you are a Nintendo fan, particularly the yarn Yoshis. The only problem was they used Smash poses for many of them necessitating supports - something they have fixed for the non-Smash Amiibos. Amiibos might not be as useful in game as Skylanders or Infinity, but they are great collectibles if you are a Nintendo fan, particularly the yarn Yoshis. I think this is where Nintendo and retailers underestimated amiibo demand - Nintendo has been around for 35+ years in the US and many of these characters have never had any kind of merchandise in the US (seriously, a Pit figure? yes, please!). With no actual numbers to go buy, I'd say 75% or more of amiibo purchases have next to nothing to do with the gameplay unlocks and more with finally getting awesome toys of fan-favorite characters. We used to buy those little Mario figurine collectibles, and they did nothing in any game and cost nearly as much. As far as I am concerned, they are great figures to display - and the fact that new games always have some non-essential hook as a bonus, well that's cool. Not a single Amiibo unlock is necessary to a game, the one that comes the closest is Splatoon figures that expand options on the single player levels. And the Yarn Yoshis were brilliant. Not to mention they seem to finally have a grip on the demand. Nintendo has traditionally been pretty tight on licensed collectibles. Having these figures has been fun, Nintendo has a huge stable of cool characters. I have little doubt that the nextgen Nintendo system in development will support Amiibos, so I'm sure they will bee giving these bonuses long into the future. But even if it doesn't they are still darn cool on the shelf as simple figures. Where do they go from here? I'm sure pretty much every headline game coming out will have some Amiibo tie in, if not new figures. Falco was supposed to tie into Star Fox Zero, before it got delayed. Twilight Princess supports all Zelda Amiibos, and the new one. 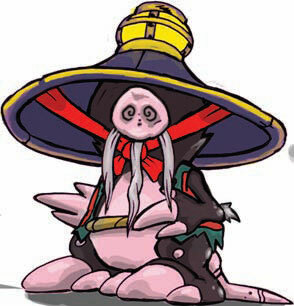 And remember they have another 700+ Pokemon that don't have figures yet. And what about Mario bad guys - Goombas, Shy Guys, Bullet Bill, Koopa - you know they are coming with the next Mario game. Who would pass up a Metroid or Ridley Amiibo? Not me! They already have a Metroid figure (non-Amiibo) that is apparently ridiculously hard to get. The part about no game requiring an amiibo is wrong, Animal crossing amiibo festival requires an amiibo to even boot the game up and also requires 1 amiibo per player in party mode. Yes, yes, it does come with 5 (will only be 4 soon as later copy's will only come with 1 figure and 3 cards). The main issue would be when people buy it used. And Nintendo has what justification for ensuring the Used market is healthy and welcoming? The game requires Amiibo, and when you buy it new you get what you need to play. If you are buying used, get it with the Amiibo, or go by their used rack and pick the ones up you want. Why someone would buy a so-so game called "Amiibo Festival" and not want to mess with Amiibo is beyond me. To be fair, it was basically $40 when it came out, as TRU had it on sale (along with all the basic starters) for $39.99 right after it was released. I suspect it'll get lower than this before Christmas. Okay, Activision since I know you're listening: a free suggestion for next year - I assume there's *some* reason you don't want to include a paper unlock code in the bundle. Next time, do this: Create a unique item. Could be something totally new or could be a simple repaint like the Platinum Treasure Chest (but make this one different in the game). The effect in-game can be minor (a flash bomb or something), so it doesnkt cost much to program in. And, of course, the new item is the unlock key for the iOS starter. Now, this new magic item is *only* in the iOS bundle. So folks who want everything *know* they have to get it. But... it's in a Mystery Box inside of the bundle. From the outside, you see a small cardboard box and it says "New Mystery Magic Item included! Why the tiny box? It's lined with foil to block the RFID chip to prevent folks from scanning it through the package. iOS players get a cool new item. Crazed collectors get something neat to go after rather than another variant they already have four of (and isn't even painted different). You still get the physical unlock key you seem to want. Everybody wins. I still curious, if anyone ever finds out - if you own the Superchargers bundle but never owned TrapTeam, will the portal from the new bundle unlock the full version of Trap Team if you link it? "One note that I thought i'd mention. If you purchase the Superchargers iOS starter pack, you can use the portal to unlock Trap Team on iOS too." The 1.1.1 app update will allow any Hot Streak to unlock the full game. We also added skipping of the intro cutscene due to popular demand. Some other bug fixes, including iCloud, along with performance improvement on lower end devices (e.g. iPad mini) The update will be out as soon as we can get it approved through Apple! The 1.1.1 app update will allow any Hot Streak to unlock the full game. Wow. That's super generous of y'all. Nice going. App update 1.1.1 has been released on iOS! Yay! Well, I hope we all learned a lesson with this - patches are awesome(yes even the ones that nerf the thing you like), do them whenever there's the need, not only when there are major bugs.